Cold water pours down a small cliff into a clear pool surrounded by rocks. 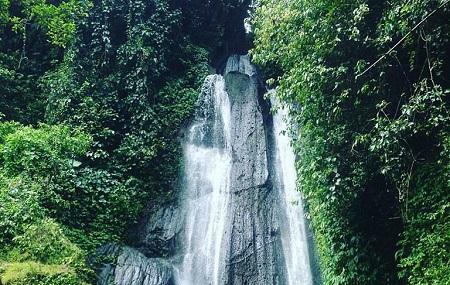 While this isn’t the most striking of Bali’s waterfalls, it’s beautiful nonetheless. The rocks make a good place to dry off and sunbathe after your dip in the pool. The pool, naturally, is a very inviting place for swim. The falls are easy to find, as they are clearly shown on Google Maps. You’ll have to climb down a steep and slippery set of stairs without handrails to access it, though. Take care of your belongings, as the area around the falls has a sizeable monkey population. Bring your own food and drink as there are no places to eat nearby. How popular is Dusun Kuning Waterfall? People normally club together Pura Ulun Danu Batur and Nusa Lembongan Island while planning their visit to Dusun Kuning Waterfall.